A mishmash of technology, economics, travel and anything else I feel like! Update: Oct 25 – Added some more tests. One for the CBD and one for Tanah Merah. 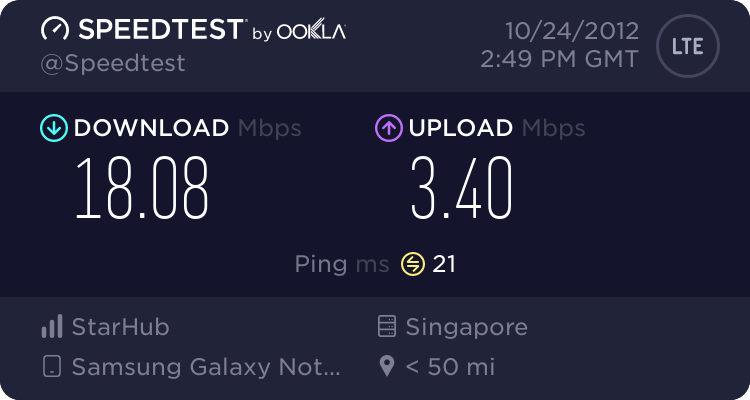 After receiving my Samsung Galaxy Note II LTE at Starhub’s poorly planned and executed pre-launch event with ridiculous queues and processing times I wondered what the LTE performance would be like on Starhub’s network. As it happened I was in Chinatown on Sunday for most of the day, so I did two tests with the Speedtest.net application. Both of the tests were at the People’s Park Centre at the intersection of Upper Cross Street and Eu Tong Sen Street. The first test was reasonably impressive, but not amazing, with 22439 kbps down and 21126 kpbs up. Ping time was 33 ms. 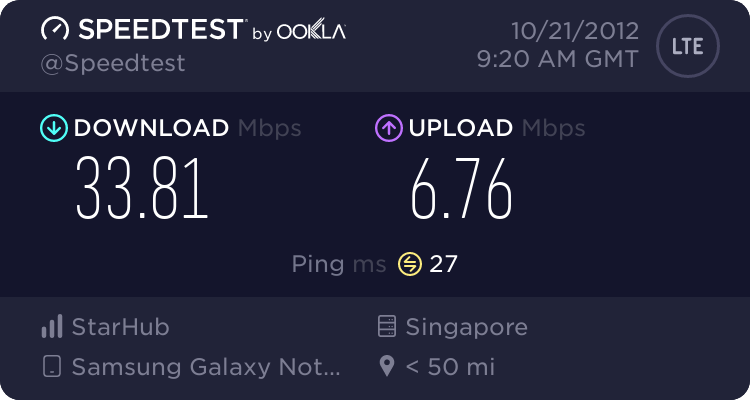 The second test was even faster on the down speed, with 33808 kbps, but the up speed dropped significantly to 6757 kbps. One thing that I found frustrating is that when I received a call the phone dropped back to the 3G network and I had no way of getting it back to the LTE network later on. There is no “LTE Only” option in the settings. I haven’t read the phone manual to work out if there is a preference for LTE over 3G by default, but it certainly didn’t want to get back on the LTE network in a hurry! 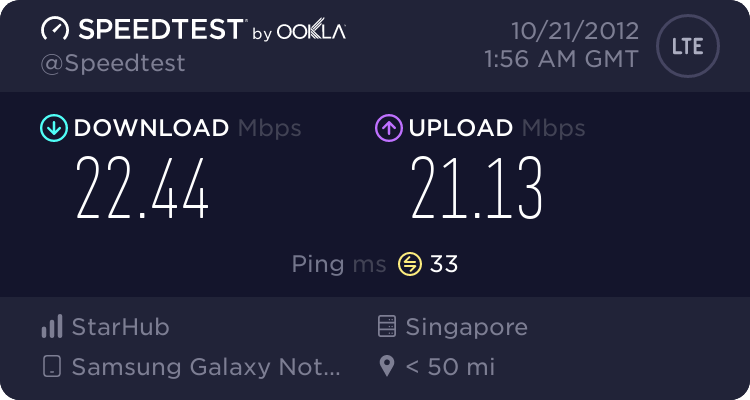 I have to go into town tomorrow, so I will do some more tests to get a better picture of the Samsung Galaxy Note II LTE’s performance on Starhub’s LTE network. 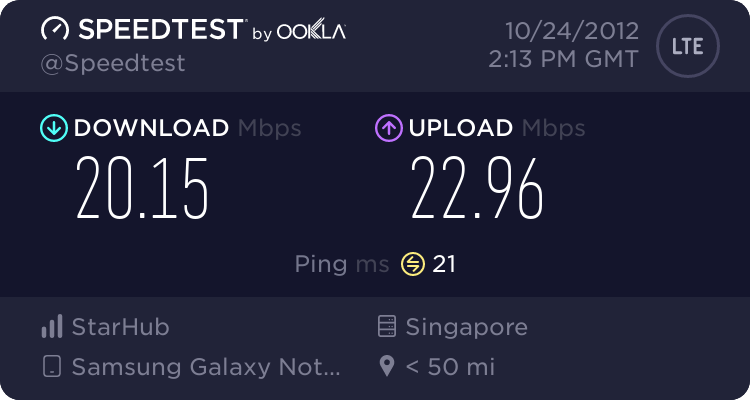 That is quite a stunning difference in download versus upload speed at Tanah Merah when compared with all the other tests so far. This entry was posted in Android, Computers, Singapore and tagged Samsung Galaxy Note II, starhub on October 23, 2012 by louco73.